These words from “Hamlet” are well-worn, but they are tragically apposite for Armenia’s second city, Gyumri. The sorrows began when an earthquake devastated the city in 1988 and then continued with the collapse of the Soviet Union three years later. This epic unravelling of the world’s biggest state gutted all industry in Gyumri that had survived the natural disaster. Over the last generation, few cities surely have contended with such challenges. I travelled north from Yerevan, through a barren, stony landscape, to see how Gyumri was faring today. What I found was a complex story of decline, poverty and hope. The poverty is more shocking than I had expected, but the signs of hope are real. “At 11:41 on December 7, on a misty and bleak December day in 1988, the mountains gave a start and with great force shook the earth. “Towns, villages, schools, nurseries and industrial plants were instantly destroyed and more than one million people were left homeless. Big events like Armenia’s earthquake rupture time. When the people of Gyumri talk about their lives, they often say that something happened “before the earthquake” or “after the earthquake”. The point is that lives dramatically changed. There really was a before and an after. Even if your house was still standing, even if your whole family survived, you emerged into a changed world. In Gyumri, I went to a bed and breakfast run by Artush and Raisa Davtyan. Artush told me that they had been at home with their two sons watching a Russian film on television when the earthquake struck. He remembers the floor of their stone-built house rising about half a metre as the shockwaves rippled through the building. Everyone in the family emerged unscathed and amazingly the house withstood the ordeal. Before the earthquake Artush, now a tourist guide, was a scientist working in the physics department of a research institute. But the disaster just knocked the stuffing out of Armenia’s finances and after the earthquake there was no research work for Artush or his colleagues. Artush said that in the immediate aftermath of the quake Moscow promised a rapid rebuilding of Gyumri, along the lines of the heroic resurrection of Tashkent in Central Asia after its tremor in 1966. But times had changed and the Soviet Union was in terminal decline as a political entity. There was no repeat performance of fraternal workers arriving from other Soviet republics to rebuild a shattered city. After the Soviet Union ceased to be, supply lines between the republics collapsed and there was a further giddy shrinking of the city’s economy. Artush said that Gyumri’s textile factory had been the second biggest in the Soviet Union, employing 10,000 workers, mainly women. But with the end of the Soviet Union the supply of cotton from Uzbekistan stopped and the factory closed. He said a buyer of the plant carted all the machinery off to the Iranian city of Shiraz. Today, most of Gyumri has finally been rebuilt. But work is scarce, wages are low and people are leaving in search of a better life. Studies have shown that nowhere in Armenia is depopulation so severe. 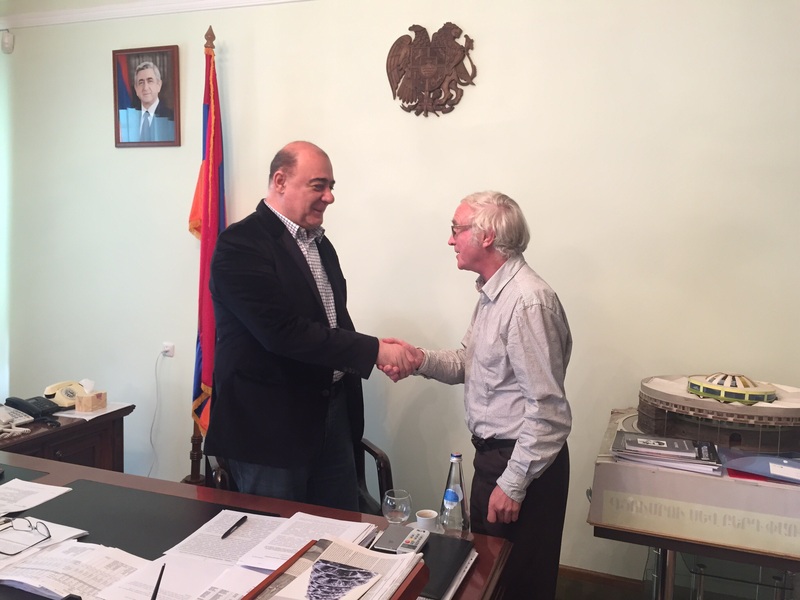 I went to see the mayor, Samvel Balasanyan, to get his take on matters. The mayor, a tall, broad-shouldered man who is one of Armenia’s leading beer magnates, told me in his office that the population of Gyumri had dropped from 225,000 at the time of the earthquake to 125,000 today. The mayor said that 2,500 families still lived in metal containers put up after the earthquake as temporary accommodation. He refused to be drawn on when the last of these families would finally get proper homes, saying it depended on finance. During the interview, a city hall official named Armen Hovsepyan acted as my interpreter. 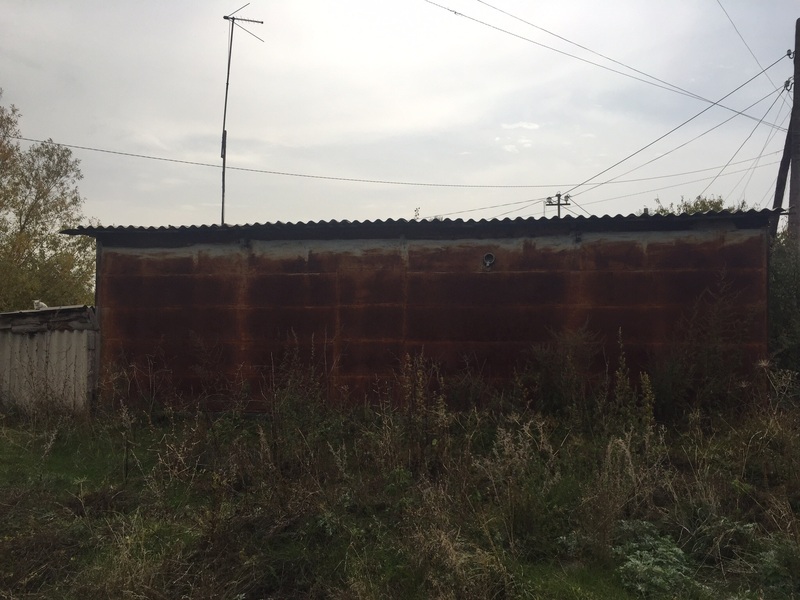 It turned out that Armen was one of the unfortunates who still lived in a metal container. Indeed, except for four years when he studied in Utah he had lived in this “temporary dwelling” since he was a baby. He said these containers were designed to last as homes for four years and they were poor protection against the elements. The day after my conversation with the mayor, Armen took me to see his home. Technically, it is two metal containers placed side by side. There is a sitting out area by the front door, a living room, one bed room and the kitchen. In the ceiling above the kitchen table a tear is clearly visible in the fabric. Armen shares this home with his mother and an elderly female friend of the family. All around their house the urban landscape is an endless succession of metal containers still housing people. At the time of the earthquake Armen was a four-month-old baby, living with his mother in a third floor apartment just metres from where he lives now. He is lucky to be alive. Rescuers got to him probably just in the nick of time. “It took seven hours to get me out of the apartment, in freezing cold,” he said. Although Armen has an American university degree, fluent English and a responsible job in city hall’s department of foreign affairs and tourism, his monthly salary is just 50,000 drams ($104). I never asked Armen outright why he had come back, but I didn’t really need to. He has such an obvious love for his city. For me, extended travel only makes sense when you meet people like Armen, who love their patch of the earth. The fact that he was in Gyumri at all struck me as being part of the hope for the city. One of the hats that Armen wears is as a volunteer at a charitable foundation, which is trying to raise funds to make Gyumri a better place and persuade people to stay. The foundation website is http://www.gyumriprojecthope.org. At city hall, his main job now is to attract tourists and I doubt that Gyumri could find a better person to do this. Armen knows his city well and conversation about it just comes tumbling out of him. 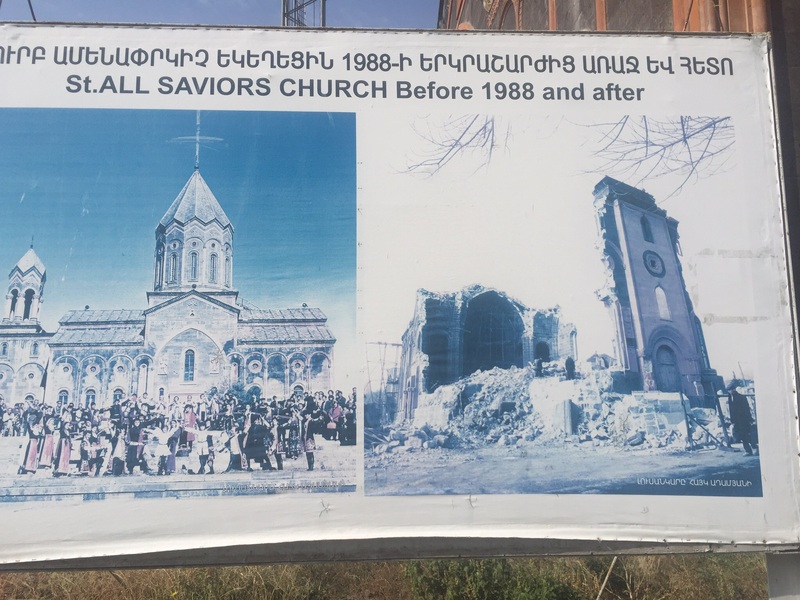 Did I know, he asked, that Gyumri’s 19th century Church of the Holy Saviour, still being rebuilt after the quake, was a copy of the cathedral in Ani, the ruined Armenian city over the border in Turkey? “The architect went every Thursday by horse and carriage to copy the details of the cathedral,” said Armen. Ani, which thrived in the Middle Ages, is an enduring source of fascination for Armenians. The fact that, like Mount Ararat, it is on Turkish soil feels deeply wrong to them. It was Armen who told me that Gyumri was the birthplace of George Ivanovich Gurdjieff, a 20th century mystic and spiritual teacher. Gurdjieff was an early example of a modern thinker who sought to take the wisdom of the East to the West. It seems absolutely right that he was from Gyumri, an Armenian Christian city with Kurdish Yazidi villages in the surrounding area. There is a school of thought that Gurdjieff was a charlatan, but then the same could probably be said of many a spiritual teacher. He certainly attracted some interesting followers, including a senior officer in British military intelligence and a Harley Street psychiatrist. With his shaven head, black moustache and piercing eyes, Gurdjieff was a striking figure even in the world of esoteric thought. His father, a cattle herdsman and bardic poet, is buried in Gyumri and Armen told me that some Americans come to the city solely on account of the Gurdjieff link. 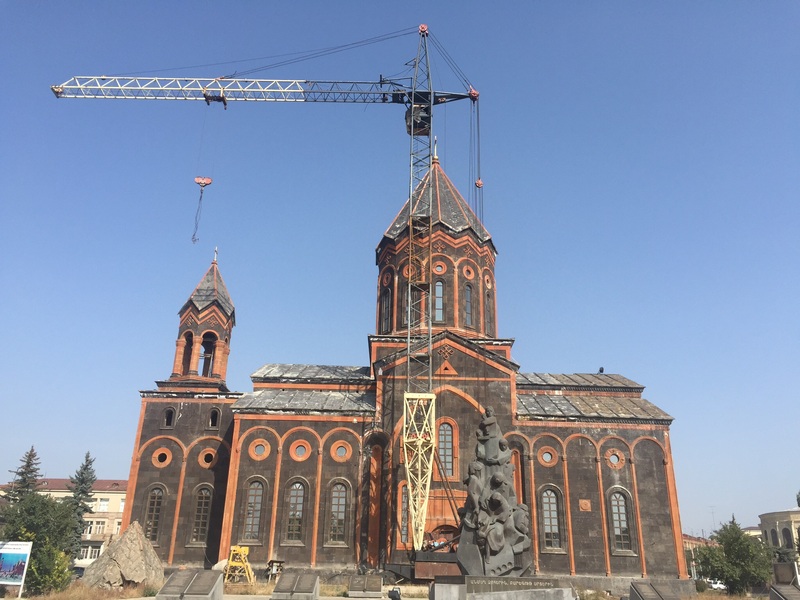 For those with no interest whatsoever in Gurdjieff, does Gyumri make sense as a holiday destination? I would certainly say it makes sense as part of an Armenian tour. If you stay in a cosy B and B, as I did, there is no shortage of creature comforts. The city is not rich, but it has a welcoming feel, smart people and a bustling market. Step nimbly past the ageing Ladas driving by and you enter an outdoor market which is just as I like them. In my book, markets should be noisy and this one is. There is the whirr of coffee grinders and the banging of metal in shops selling wood stoves – you can feel the ancient lineage of this place. 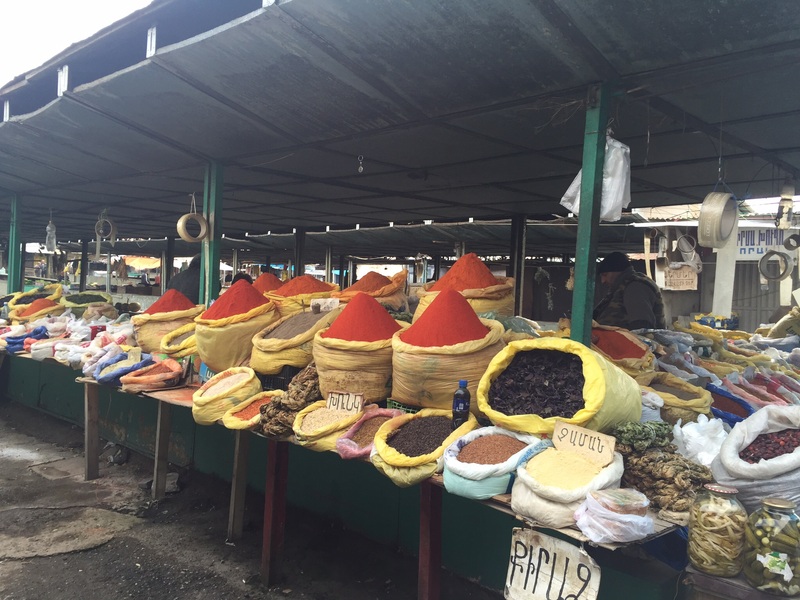 This being Armenia, the fare on offer in late October included grapes, grapes and more grapes, nuts of all kinds, live fish, crayfish, Armenian cognac, pomegranate wine, spices, coffees, carpets and Turkish electric heaters. I want to open up one final new thread, to give more substance to my assertion that there are real signs of hope in Gyumri. I went one day to see the work of a foundation financed by Diaspora money. The Tumo Center for Creative Technologies, funded by the U.S.-based Simonian Educational Foundation, opened a branch in Gyumri in September. It is doing impressive things with youngsters between the ages of 12 and 18. They come after school, typically for two workshops a week, and can choose free courses from the four areas of animation, film-making, computer game development and web design. When I dropped by, there were dozens of youngsters in the classroom and spanking new Apple computers everywhere. The manager who briefed me at Tumo was a feisty young woman who grew up in Los Angeles, Nare Avagyan. After hearing so much in Armenia about emigration, it was a most refreshing change to meet a sparky young Californian who had come home to her Armenian roots. Nare has been living in Armenia since 2012. The Tumo Center struck me as a good example of the American “can do” philosophy, allied to Armenian patriotism and Armenian American money – all in all, a potent mix. In Yerevan the Tumo Center has more than 6,000 active students, she said. The Tumo Center in Gyumri is in temporary accommodation in a technology park, but Nare said the plan was to renovate the city’s old theatre, a bigger space, and use that. I have let this run because English-language articles about Gyumri are rare. And, as you’ve probably guessed, I rather like the place. I wish it well.